A chamber piece about history which looks like a combination of Rembrandt and an old photograph. In the podcast we discuss how Joe Wright might be getting short shrift as a director and the excellence of the performances:Gary Oldman, Kristin Scott-Thomas, Ben Mendelsohn and Lily James are all marvellous. Mike mentions how the film is not the life of Churchill but a few defining weeks in the life of Churchill; how the film shows us nothing of Dunkirk, we merely see it on a map; and how wonderful a supercut of this and Dunkirk might be. Mike also highlights how the cemeteries of Belgium tell a very different story from the official one in relation to Britain’s ‘going it alone’ in the two World Wars. We discuss how the film’s emotional manipulations are cheap but how one finds oneself responding to the film’s jingoism. I would have enjoyed it more had the film been less of a Brexit film, whether the filmmakers intended it or not. I would really like to see a film with the same actors just focussing on the relationship between Clemmie and Winston, and there’s a wonderful volume of letters full of sketches of kitties and piggies called Speaking for Themselves that I wish someone would draw on for a film. Mike guardedly recommends the film and is instantly remorseful but agrees there are pleasures to be had from it. 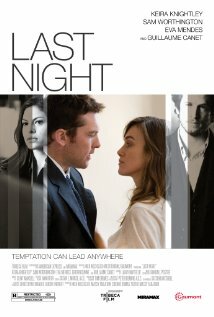 But…..
Kiera Knightley and Sam Worthington play a well-to-do couple tempted into adultery. She’s a journalist. He works for a property company. His rival is Gullaume Canet, a writer. Eva Mendes is the alluring femme fatale who does indeed lure. The film aims for maturity and complexity but fails and feels rather inept. Worthington is charmless. Knightley is almost good but not quite. The film seems prudish both in what it shows physically and what it depicts psychologically and verges on the dishonest. It doesn’t look good enough either and Mendes and Knightley are sometimes shot in what seem to be their worst angles: Mendes with a bottom-heavy face, all round cheeks; and Knightley with an almost masculine, heavily delineated jaw-bone. Last Night aims for louche glamour but just feels a bit cheap. Keira Knightley reveals herself as a Film Goddess in this film. Some of her close-ups have to be amongst the most beautiful ever filmed and she is the film’s core strength; she carries the movie, and not only with her beauty. The film might be a tad too exquisite; the sets, costumes, jewels and décor are so dazzling one can’t help but be distracted. However, the film is also formally daring, extremely stylized, all shot as if it were on stage; and this adds an intellectual dimension to what’s on display; forces us to try to figure it out. I understand the original funding for the film fell through at the last minute and the filmmakers had to mother some invention presto. They’ve done a good job. Of the cast, it is Jude Law as Anna’s cuckolded husband, Karenin, who finally allows the audience to discover him as a great actor. Of the protagonists, he’s really the only one who conveys a recognizable person and a way of life. It’s interesting because the role is historically a dud (few actors win kudos for playing middle-aged, dull, and respectable). Yet, Law makes us believe him in the part, quite an achievement when one considers his career and persona He also helps us to understand why Karenin acts the way he does and, if we never quite empathise, we certainly feel for him. I was beginning to find the film quite moving near the end, though it was in relation to Law’s Karenin rather than Knightley’s Karenina, which is partly the film’s main problem. 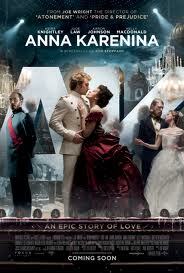 Aaron Taylor-Johnson as Vronksy looks like a Boucher drawing, one doesn’t know whether to admire or lick him; worse, one doesn’t understand or feel for him; and one should also feel more for Anna Karenina than this film or Knightley allow for. Aside from Angelina Jolie, Knightley is the only person in current cinema who may be called a Goddess in the sense Dietrich and Garbo were; beautiful, remote, too divine to be quite human. This is the film’s flaw (it was a major one in the Garbo version as well; Vivien Leigh’s Karenina was not remote but her vehicle had other, even more considerable, flaws). This version, directed by Joe Wright, whilst not a masterpiece, is my favourite: intelligent, imaginative, sumptuous and with a cast that, with all its limitations, is a joy to behold..